What was the secret of St. John Chrysostom’s success as a leader and reformer? The spiritual leaders of a city or society inspire the moral lives of their citizens. They understand well people’s needs and hopes; they connect with them at a deeper level than others, leading them to God. This is what St. John Chrysostom (349-407) did as priest and later bishop. What were his means for doing so? He was a renowned preacher drawing large crowds to hear his homilies, in which he explained the Scriptures and taught the faith in a straightforward manner, taking examples from everyday life which contrasted with the allegorical interpretation of the Scriptures common in Alexandria. His homilies on many different books of the Bible are still widely read. 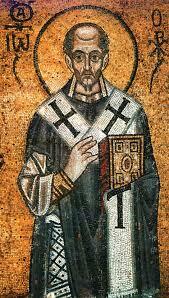 As Archbishop of Constantinople, Chrysostom composed beautiful additions to the Divine Liturgy (the name given to the Holy Mass by Eastern Catholics) that continues in use today. It was his duty to meet with many people: “He mixed freely with all ranks of men; and he made friends, affectionate friends, of young and old, men and women, rich and poor, by condescending to all of every degree.” He had many friends who loved him dearly, as well as many enemies, because his moral teaching was demanding. Among his friends were men and women who today are honored as saints. Newman contrasts St. John’s personality with that of two friends, also bishops and saints, Basil and Gregory Nazianzus. Travel to the place of exile on the Black Sea took him through cities that held significance for him because of their association with events and peoples. The journey began at Nicaea, the place where the council had condemned Arianism, and took him through Caesarea, the See of Basil; and through Nyssa, the home of his brother St. Gregory; and near Nazianzus, the home of the other St. Gregory. During his travels Chrysostom wrote letters to his friends. Newman indicates how St. John thought of their health and concerns more than of himself. He wrote, for example, to Olympias, a young widow named from a wealthy family, asking her to write to him with news of her health. He tells her not to worry about his health and care. Olympias became a deaconess and is honored as a saint. Into his sketch of this great fourth-century Archbishop of Constantinople, Blessed Cardinal Newman insinuates the great value of friendship in life, and in any work of spiritual and moral renewal. This too was the secret to John Henry Newman’s great success in 19th century England. He had numerous friends and made it a point to pray for them and to write them often; he shared their joys and sorrows, and he asked for their help in many different ways and inspired them to holiness. Friendship and good example continue to be paramount in shaping the society in which we live. When asking the question: “What can Christians do in the face of the crisis of faith and morals of contemporary society?” one sure answer will be to consider the importance that those great spiritual leaders of the past have given to friendship. As long as genuine and loyal friendship exists Christians will continue to be salt and leaven for the world. St. Josemaría Escrivá would later write: “These world crises are crises of saints.” Society needs new saints who through their friendship will lead countless other men and women to live as God’s children. Deaconesses were women who served in the early Church especially helping in the liturgy with matters regarding other women such as the baptism of adult women, anointing of catechumens or instruction.